With a wide and relatively non-uniform prospect pool, combined with visitor anonymity, B2B lead generation tactics require insights beyond the capabilities of predictive analysis (analysis of historical data). User intent data analysis is used to fill the gap. Predictable prospecting is B2B user intent data paired with predictive analysis to form a set of marketing tools that can help companies maximize the effectiveness of and return on their sales and marketing efforts. 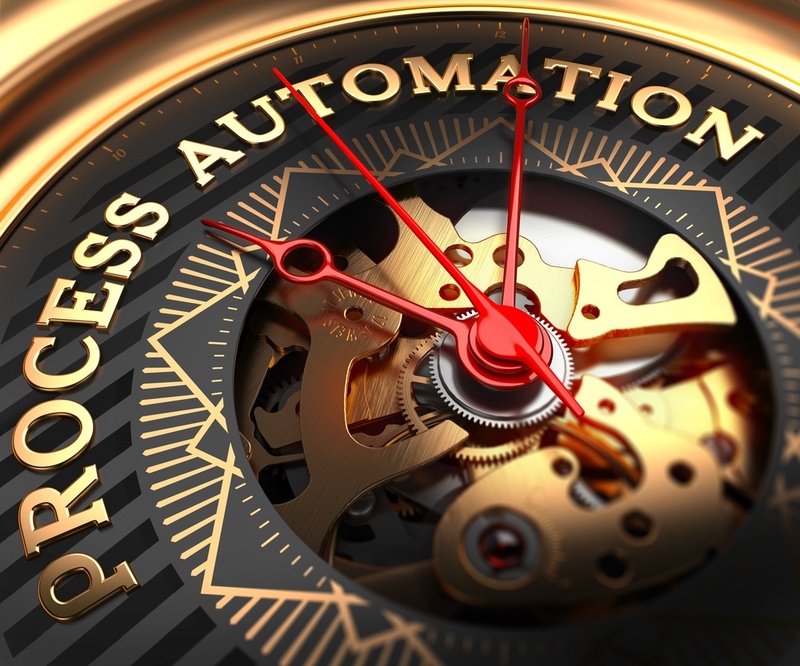 How sales prospecting has evolved in 2019? Sales and marketing campaigns used to consist of massive pushes of promotional content to a pool of potential customers. Regardless of the communication channel, the messages were largely blind and impersonal. The very low return on investment, along with the fact that a small fraction of this pool returned most of the revenue, led companies to seek a more customized and flexible approach. Predictive analysis methods have helped marketers narrow the campaign scope and focus on delivering marketing messages to the most promising prospects. Plus, companies can now produce high-quality campaigns customized for the audience and/or the customer funnel stage. B2B marketplaces have been reshaped by the recent and drastic evolution in mobile and technology. Now, with marketing information widely and easily accessible, customers are looking for companies, rather than companies looking for customers. However, with a wide and relatively non-uniform B2B prospecting pool, and visitor anonymity, B2B marketplaces require analysis beyond historical data. B2B user intent data analysis is used today to fill that gap, supporting marketers’ focus on prospecting B2B users. Predictable prospecting is B2B user intent data paired with predictive analysis to form a set of marketing tools that supports the marketer with better account insight, helping the company maximize its return on sales and marketing efforts. B2B sales prospecting is now both predictive and with augmentation of user intent data, predictive as well. Interpret user data at every stage of the customer journey and deliver personalized services—such as content or recommended products—based on intent and “next action” assumptions and predictions. Recommendation engines and artificial intelligence modules may be used for this. Prioritize B2B leads or prospects, and then focus on accounts with the highest potential ROI through methodologies such as predictive lead or engagement scoring. Marketing approaches like account-based marketing may use these methodologies. Access insights on behavior and trends. Often, increased account insight leads to better before- and after-sale services and easy renewals that finally end with loyal customers. The backbone of all of this is data analytics: Data, coming from a variety of sources, are continuously captured, cleansed and consolidated. Mining techniques are then applied to find patterns and build appropriate models. Data analytics may be predictive (based in machine learning techniques) when voluminous historical data are available or descriptive, producing an easy, quick and indicative conclusion. In the B2B lead generation space, the prerequisite for delivering personalized services is being able to retrieve user actions, group them, and translate them into behavior or trends. When adopting predictive analysis techniques, this kind of customization is possible in most cases at the individual level. By leveraging this kind of B2B user intent data, marketers can deliver personalized promotional services and content, thereby increasing effectiveness and the likelihood of conversion. - Real-time, “live” data, such as capturing web activity or submitting a web form. 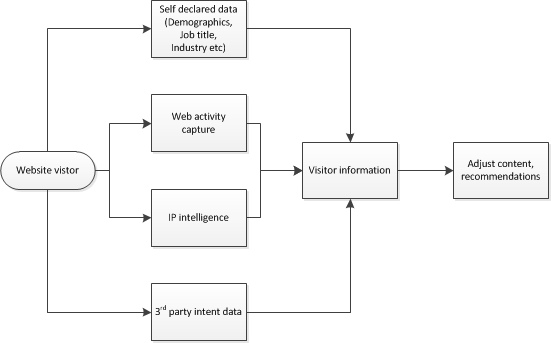 - Data from an IP intelligence system or third-party intent data provider. - Structured CRM and ERP data or other first-party data, such as an already known B2B user. Regardless of the source, the data should be consolidated, stripped of noisy data, and then stored in a warehouse database. Depending on business requirements, a predictive analysis model will be chosen. Intent data will guide the sales prospecting team to learn and outreach where the real potential customers exist. Recommender systems are the most recognizable examples of B2B predictable prospecting. They’re widely used and found in everyday examples like “Up next” video recommendations on YouTube or “Other movies you may enjoy” on Netflix. These are intelligent information systems that, depending on the algorithm applied, may be based on user preferences (collaborative filtering), product features (content filtering) or both. They are primarily based on an unsupervised predictive model that generates clusters of users or products with similar buying behaviors and features. Recommender systems are considered to be an intelligent salesman: one that knows B2B user behavior and is able to make suggestions that will be most beneficial to the customer. Smart content systems—those that adjust content based on the user consuming them—have become a popular tool for personalizing marketing services. Not only can they deliver flexible content, but they can also be easily adjusted for the channel (client device) that is used to access the content. These systems are based on the principle that personalized content and ads generate better engagement with existing and prospective customers than static ones. Smart content systems use marketing techniques like customer segmentation to group B2B users by similarity. Personalization is based on the level of similarity, with better segmentation allowing more accurate personalization. B2B user intent data considers the behavioral information collected through users’ online activities combined with trends and behaviors derived from historical data. 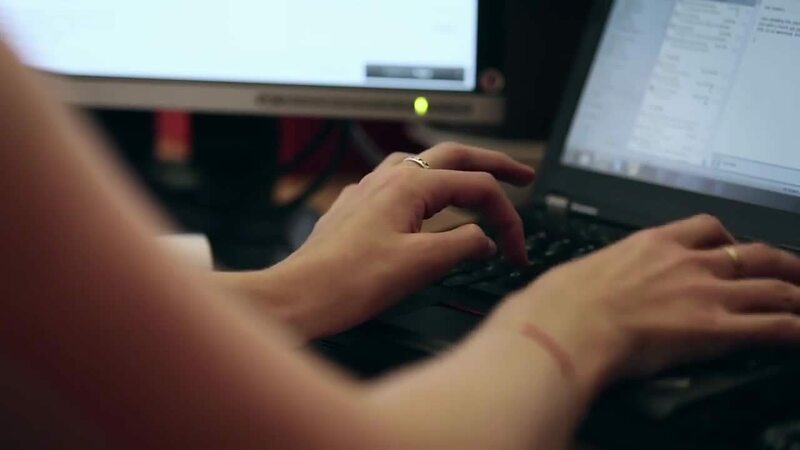 While retrieving B2B user intent data is fairly straightforward for known customers, this is not the case when it comes to anonymous website visitors. For existing customers, intent data is built using historical transactions and site distribution information from the CRM system and web activity. Web activity capturing systems, IP intelligence systems (those that can translate IP addresses to B2B customer names), and reports from third-party intent data providers are used to compile behavioral insights on first-time customers. Scoring systems are used to rank B2B leads or prospects against certain business criteria. They are used throughout the entire customer journey and, depending on the stage, they are called lead, engagement or opportunity scoring. Usually, a high score implies that the lead is profitable; while a low score indicates the opposite. Lead scoring has been employed as a marketing tool for a long time. Traditionally, it used explicit or implicit user information to score and rank leads. This information could include data like company size, job title, geographical information, click counts, email opens and/or web activity. Today, predictive scoring systems use predictive analysis to rank prospects and leads against a statistical model, delivering more detailed and precise rankings. The model definition—aligned with the ICP (ideal customer profile) definition—consists of defining attributes, coefficients and weighting factors that build score probabilities for a lead. Predictive scoring systems use supervised machine learning models that use regression or other techniques. B2B predictable prospecting is the outcome of predictive analysis, which is typically performed using analysis tools and software to mine large amounts of data for similarities and patterns. Then, based on these patterns, the analysis model can make predictions based on data that is not available. Predictive analysis software is an artificial intelligence system in the sense that it can interpret the environment and produce a result on its own. The quality of B2B prospecting is directly related to the quantity of data it is based on—the higher the volume, the more accurate the result. Data comes from a variety of sources, including internal and external, structured, like that found in CRM, or unstructured, like that from social media. Regardless of the source, data should be consolidated, cleansed and prepared for data mining. In the B2B sales prospecting, data from a CRM, ERP, social media and web activity captures are particularly valuable. Depending on the business objectives, statistical models such as regression analysis and classification regression may apply. Models should be aligned with similarities and patterns over data. The model with the best fit (i.e., minimum uncertainty) against a sample dataset should be chosen. In B2B predictable prospecting, models used for analysis can deliver an outcome (supervised models) like lead and engagement scoring, or not (unsupervised), such as in the case of clustering. Since new data are constantly arriving, it’s necessary to continuously monitor and evaluate the model. The predictive analysis model is not a static “black box”—marketers should routinely assess and adjust its parameters to address challenges. Marketing techniques like data-driven account-based marketing exploit better account insight when using predictive analysis. Depending on customer segmentation, marketing is based on predictively scoring leads against ideal customer profiles. 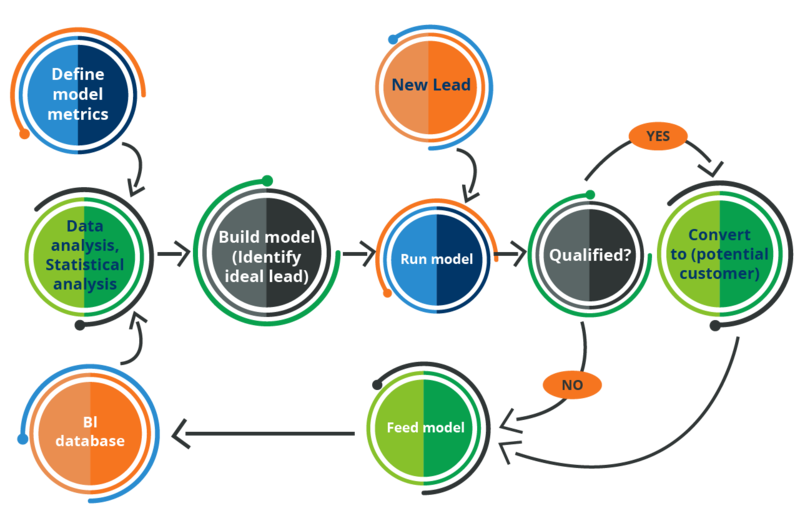 Qualified leads or key account parameters may include profitability level, operating industry, geographical information or demographics, along with measurable or estimated information. Over the last few years, data has become one the most valuable business assets. The ability to efficiently process, collect and store, and analyze large volumes of data is a critical analytics activity that became feasible only with the advent of cloud computing technology. - Technology evolution that will generate faster and reliable data processing. This may include evolution in technical topics such as NOSQL databases, distributed file stores, and memory data fabrics. - Expansion of analytics usage throughout the entire customer journey. This could be analytics that will predict required sales and marketing resources, predictive cross-selling and up-selling. Search and discovery tools allow marketers to extract information from large unstructured databases. Unstructured data often have a higher level of ambiguity and higher difficulties in terms of integration and analysis. Improving the performance of this data source will improve accuracy in B2B user intent data, and then, subsequently, better prediction accuracy. Many B2B companies are faced with the challenge of multiple and distributed sales and marketing systems and applications, each with its own silo of data. Integration of customer data is critical. If data from various sources—external or internal—can be effectively correlated and analyzed, prediction accuracies will improve. Software systems that combine the predictive engine with analytics and transactional processing are the industry leaders. Enterprise-level CRM systems like the Salesforce platform, powered by the Einstein AI engine and with integration capabilities and strong analytics, fulfill all predictive analytics activities. 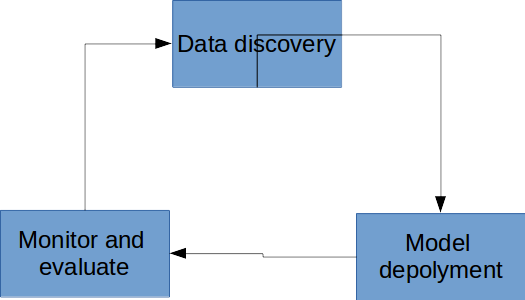 Its tier-based architecture allows separation of analysis infrastructure with tools that may use its output. 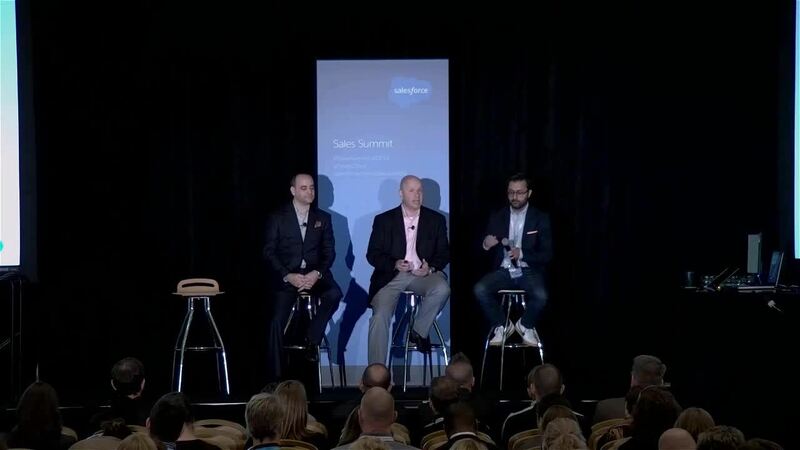 Learn more on Salesforce Predictive MarTech Alignment. The foundation of B2B lead generation and sales prospecting has changed. There is a better way now. B2B predictable prospecting, using machine-learning techniques, is the most widely used application of artificial intelligence. It has proven to be a highly effective and popular tool for marketers, as demonstrated by the year-over-year doubling of implementations and the expectation for investments to quadruple in 2021 compared to 2017. However, with a wide and relatively non-uniform prospect pool, and visitor anonymity, predictive analysis (analysis of historical data) can only go so far in the B2B marketplace. User intent data analysis can fill the gap. Using predictable prospecting—user intent data paired with predictive analysis—marketers can more effectively identify, engage with and convert prospects. Although figures show a significant increase in area of application and investment, there is room for improvement in 2019 in performance and accuracy and in expanding application in other areas. What Does Predictive Lead Scoring Mean for Your Business?